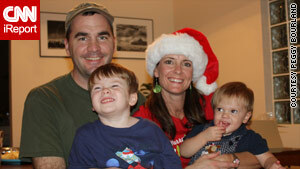 Ken and Peggy Bourland hold their sons Charley and Andrew. She has not heard from him since he sent an e-mail from Haiti. (CNN) -- Peggy Bourland can't eat. When she lies down to sleep, she fights the urge to go outside and curl up on the cold, hard ground. "Ken can't eat right now. He can't sleep in our bed," she said, her husband's military dog tags around her neck. "I won't have what he cannot have." Last Tuesday, from his room at the Hotel Montana near Port-au-Prince, Haiti, U.S. Air Force Maj. Ken Bourland sent an e-mail to his wife telling her that he was fine and had just settled in for what was going to be an exciting time taking a disaster preparedness course. It was 4:51 p.m. ET. Less than 10 minutes later, an earthquake leveled much of the Haitian capital, including the Hotel Montana. "I had just clicked off the e-mail and was trying to find some cartoons for the kids to watch," she said. "And then I saw this breaking news. An earthquake. I thought, 'Did California get hit again?' Then I saw Haiti." Bourland popped her laptop open and fired off an e-mail: "Please tell me you're OK."
Crews have spent the past six days searching mounds of rubble, 30 feet high in places, that was the Hotel Montana, popular with tourists and visiting officials. Some United Nations employees who lived there remain unaccounted for, the U.N. said Sunday, and Alain Joyandet, the French minister of cooperation, said approximately 200 French tourists staying there had not been heard from. There is reason to hope. On Friday, a woman trapped in the hotel's collapsed bar was rescued. In the past few days, students from South Florida's Lynn University, who were in Haiti on a humanitarian mission to feed the poor, were freed from the Montana's rubble. Six others with the university are reportedly still missing. Peggy Bourland gets two calls a day at her suburban South Florida home -- one at night, one in the morning -- from the family's assigned military liaison. There's nothing to say, really. She's told to be optimistic. She tries. After the second call, when she has tucked the couple's sons, 16-month-old Andrew and 3-year-old Charley into bed, she allows herself to cry. "I don't do it in front of them." She finds it overwhelming to return to thoughts about the Sunday before Ken Bourland left. It was Charley's birthday, and another military family came over. "Ken sang to him and we all said, 'Daddy's going on another trip.'" The Bourlands' fifth wedding anniversary will be in March. Their first date -- set up by her boss and his sister -- was one with hours of talk and lost time. She liked the fact that he asked questions about every conceivable scenario that might arise from a decision. He analyzed, where she just went with it. He prepared for the small and big things. He had been mulling for weeks, exhausting Google, over what kind of television to buy. Ken's steady demeanor has rubbed off on Chance, his stepson. Peggy's son was 9 when she introduced him to Ken. The helicopter pilot endeared himself quickly with camping and a mutual zest for video games and remote control cars. Now 13, Chance understands what's going on. "I let him talk when he wants to," she said. "But sometimes there's nothing to say. You just wait and continue to wait, hoping for something good."